While our tap water at the plant is completely potable, there is no guarantee on the state of the pipes running from Consolidated Water to where ever you are. 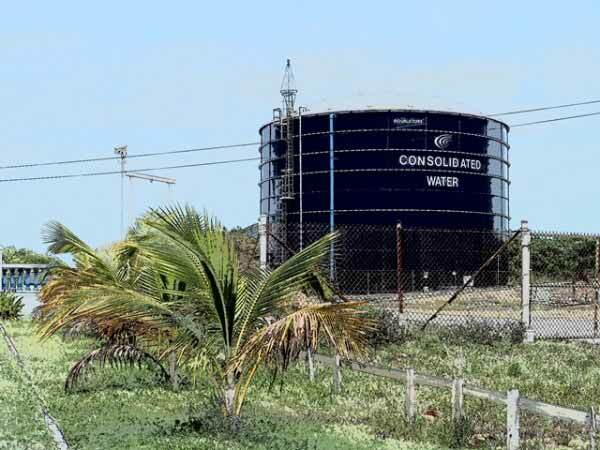 The Reverse Osmosis Plant owned and operated by Consolidated Water Belize Limited (CWBL) in San Pedro, Ambergris Caye is a relatively simple seawater reverse osmosis process. The plant is located about 2 miles south of town central San Pedro. Seawater is extracted from two shallow wells adjacent to the lagoon. Because the wells are shallow and uncased they are under the direct influence of the lagoon water. Natural and man-made changes in the lagoon water quality have a direct impact on the plant’s operation. The raw seawater is pumped through pre-filters to remove suspended solids 5 microns and larger in size, (a micron is one-millionth of a meter…really, really small). Many/most constituents of seawater, (organic and inorganic), are smaller than this and pass through the pre-filters. The filtered water is then pressurized by two pump systems: diesel driven pumps and high pressure booster pumps, (powered by the waste/brine water flow). The pressurized seawater (about 960 lbs/in.2) is forced through two separate Trains of RO vessels and the “plastic” membranes inside. The membranes have pores about .45 microns in size. These pores are smaller than most of the organic/inorganic constituents of seawater so most salts, minerals etc. are left behind on the brine side of the membranes. The waste water, (brine) is passed through the pressure boosting pumps and injected back into the lagoon through a deep injection well. The “de-mineralized” water, or product water, is then passed through some degassifier towers to remove noxious gases, (mostly hydrogen sulfide). Before degassing, sulfuric acid is injected into the product water to adjust pH, followed by chlorine injection to disinfect the product water. An unusually high chlorine dose is applied at the plant to insure that there is an acceptable residual at the ends of our customer’s distribution system, (normally the customer supplements the chlorine dosage if necessary due to variations within their distribution system. In our case, BWSL has no facility/facilities to do this so we surcharge the chlorine dosage to keep the water safe). After disinfection the water is pumped: directly to our customer’s storage tank; to CWBL’s storage tank; or a combination of both. The major operational support activity is the cleaning of the membranes when they become fouled with organic/inorganic compounds. This is an important operational consideration because it requires the removal of 50% of the plants’ capacity, (1 Train must be out of service during the cleaning process, which should last 2-4 days). While pre-filters are disposable, (1-3 months life depending on lagoon water quality), membranes should have up to a 5 year lifespan. Membrane life at CWBL is somewhat shorter than this but 3 years is the expected minimum life. When membranes become too fouled to produce adequate quantity and quality water they are replaced with new membrane elements. Replacement of membrane elements also requires an entire train to be shut down. Needless to say, because the high season demand for water equals or exceeds the plant’s capacity, taking Trains out of service for cleaning cannot be done, (during a 5-6 month time frame), shortening their lifespan. For more information on the plant and the Ambergris Caye water supply, click here to read the rest of the article and see more photos on Tacogirl’s blog! Posted : Marty Casado - Tue, Sep 8, 2015 1:39 PM. This article has been viewed 2709 times.